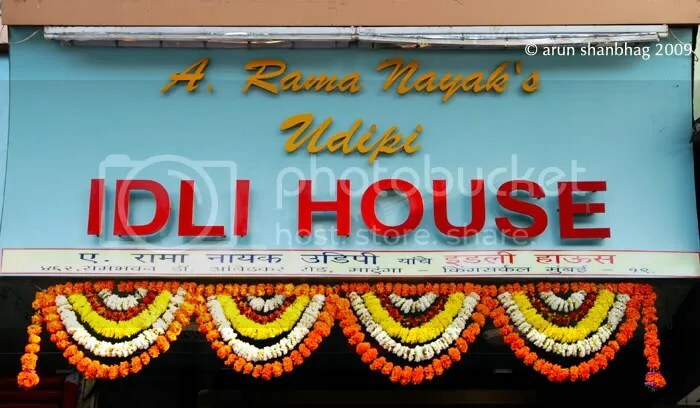 Mumbai was recently blessed with a eatery dedicated to idlis: those delicately steamed rice cakes. 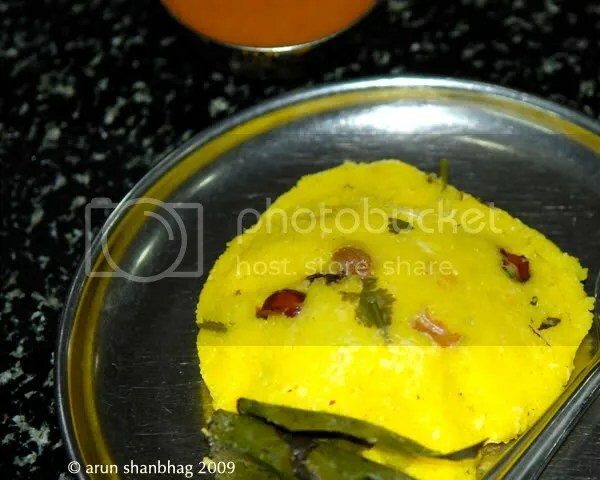 South Indians start their day with idli, dunked in sambar or a liberal side of coconut chutney. At home, I enjoy piping hot Idli Sambar for brunch, or to accompany the afternoon chah or kaapi. Leftover idlis make golden crisp Idli fry, or crumbled and tossed with a medley of spices. On family trips you have all initially groaned, when aunts unpack idlis and chutney – the ultimate travel food. By the end you are licking chutney of fingers, while fellow travelers stare with envy. It was only a matter of time that we, little m included, finally made it to Idli House in King Circle, Matunga. It’s a tiny place and crowded. Many stand and eat. The laser focus on idlis keeps the service quick and very inexpensive, making it the poor man’s meal. On any given day they serve about 8-10 types of idlis. My uncle had given directions and recommended Masala Idlis, but alas, those were not served that day. Not disappointed, we ordered just about all idle types they served. 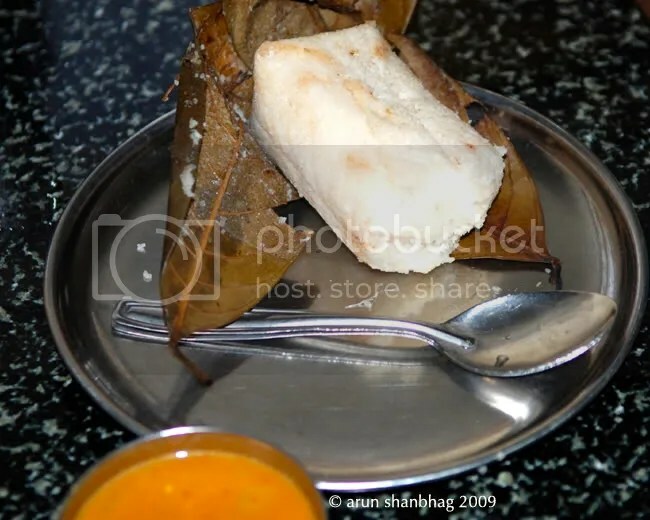 > Shilpa has recipes for 16 Idli varieties, including many seen below. Mysore Idli, or Rawa Idli, made with cream of wheat. Interestingly, in south india these are called the Bombay Idli, while in Mumbai we dish it back to them. All idlis are served with specific chutneys. Also on the table are an assortment of chutneys and puddis (blend of dry spices, to be mixed with sesame oil). Have a blast! Vegetable Idli. Slightly bland for my taste, but nothing chutneys couldn’t fix. 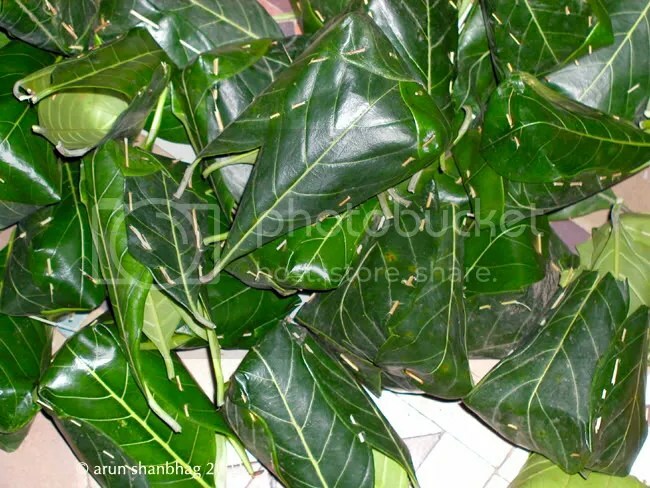 Muddo gets its name from the ‘fist’ use to cup and roll the kewda leaf (ketki in konkani), while the batter is poured in it. 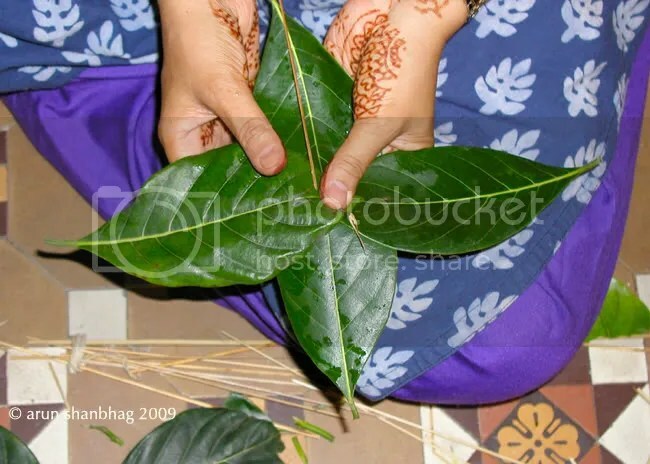 Kewda is a fragrant leaf and oils exracted from these leaves is used in agarbattis (incense sticks) and natural perfumes. Thus fresh kewda imparts a delicate aroma to the idlis. The owner tending the till mentioned that fresh kewda leaves arrive on a flight every morning from Udupi. This idli is best appreciated with a dollop of tuup, homemade clarified butter which the waiter gladly serves. Kanchipuram Idlis are one of my (and meera’s) favorites. Similar to Rawa Idlis, but made with a coarser rice flour, with added bits of vegetables, roasted cashews and raisins. Yumm! In the first millennium, Kanchipuram, near present day Chennai, was the political capital of the Pallava dynasty and a center of learning and trade. 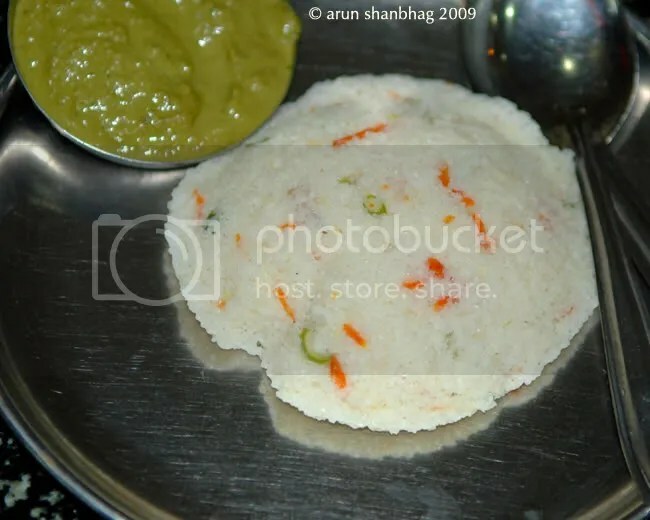 In addition to the spiritually uplifting Kanchi Kamakshi temple, Kanchi has lent its name to two others: these idlis and the exquisitely beautiful silk wedding sarees. Finally, what I had been looking forward to. 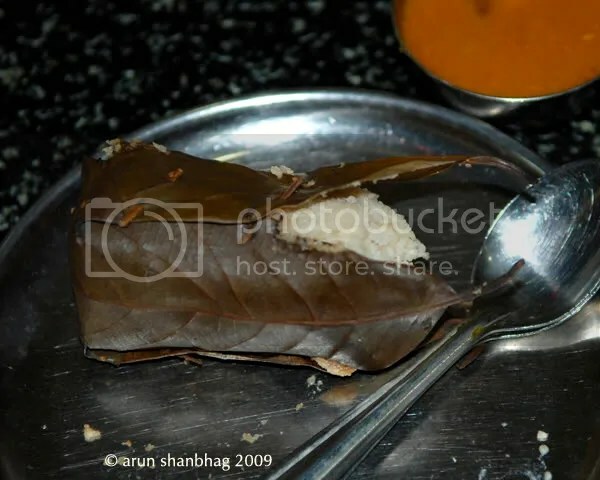 The KhoTTo: Idlis steamed in a pouch of jackfruit leaves. 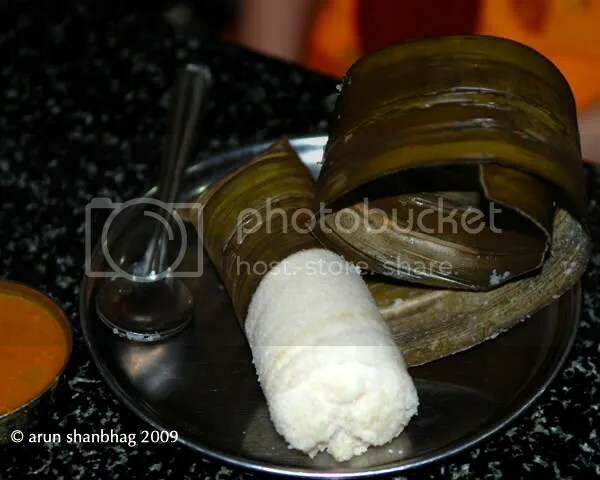 A classic konkani delicacy made at our home during Ganapati festival. See the making of jackfruit pouch below! Anticipation builds as the KhoTo arrives. I peel back the leaves and as the faint aroma of jackfruit wafts to our nostrils, the waiter eagerly offers to baptize it with coconut oil. I nod, who’s dieting! I break off a lump with my fingers and roll it in chutney before I taste it. Hmmmmm! 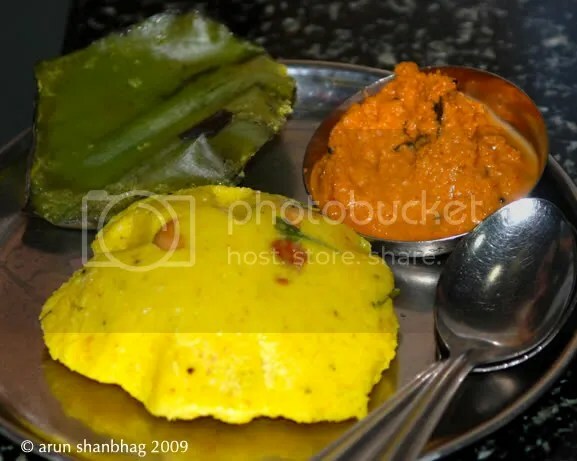 I try khoTo with many of the chutneys they served, but missed the classic chutney we make at home: fresh green chillies, crushed in a bit of water, hing and salt. 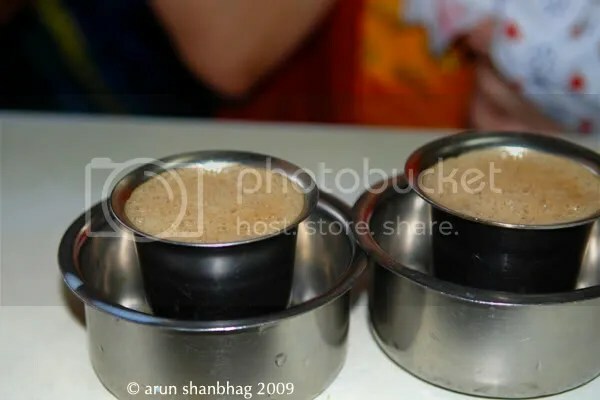 After a finger licking, idli extravaganza, we walked across the street to Anand Bhuvan for delicious Kaapi! 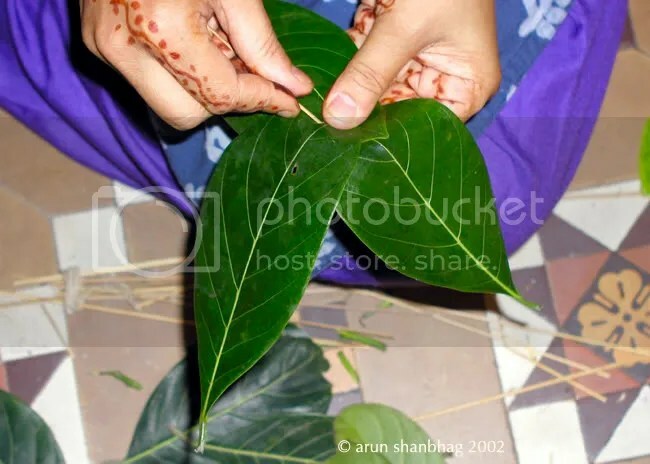 Several years ago during Ganapati celebrations at home, M was helping make the KhoTo! These are prepared and washed the day before. On Ganapati day, fresh idli batter is poured and steamed. Unfortunately, I was busy eating KhoTo and did not get to take pics of the finished product. The spine of palm leaves is used to pierce and hold the jackfruit leaves together. Really well capturd article. As much as the idlis, it was a delight to read through this post. Varun, Thank you for your kind words and the link on your site. Stopped by your blog. Keep up the good work. OK; when you do go, pl share your experience with us. and have visited this cute li’l joint several times now! Better late than never. Enjoy. Reminds me to go to Idli House too.